I'm on the mend from my root canal procedure. It was pretty painful going but I got some good rest, took some pain meds and stuck to mostly soft food. I have the first of two follow up appointments this afternoon then hopefully my mouth will be good as new. Best of all, no more tooth pain for my upcoming trip to Boston. 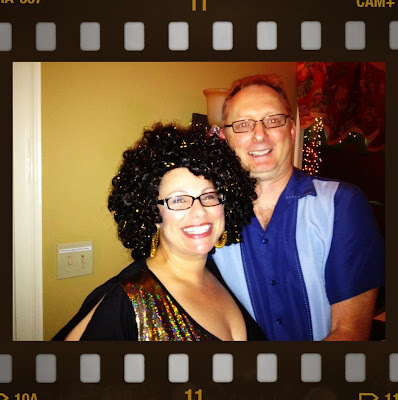 My recovery wasn't all bad, I managed to get dolled up for a 70's disco-themed party on Saturday night. It was lots of fun and I just loved dressing up like a foxy disco diva. Not everyone dressed up but perhaps I'm in the minority who thinks the best part of a costume party is embracing the theme and getting in character. I loved that wig! There were people who asked me (totally non-ironically) if that was my real hair. Hilarious. It's also my fourth anniversary of writing this blog. Four years of putting it all out there. The good and bad, the successes and failures. I've learned so much about my health and fitness, the most valuable piece of knowledge is that my health is like a bank account. When I fill my bank with good things like rest, movement and health-giving foods, I feel and look great. And when I don't, my health gets overdrawn and my body lets me now about it. It's really as simple as that. One last bit of news I want to share. Our move is still happening but the location has changed. I got my greatest wish and that's to go home. Instead of Virginia, we're headed to the North Shore of Boston. All being well with sticking to our timeline and plan, this Yankee is going home! I hope you all have a great week ahead and that the sun is shining wherever you are. OMG! I am so excited that you get to move back to Boston!!!!!! Congrats! Happy blog-iversary! I can't believe it's been four years. I am so proud to have you as a friend, wherever you may roam! Wow Bean town! How fun! You have the most gorgeous smile, I have to say. I am touched by all the heartfelt comments, I actually got a tear this morning. Thank you all for the kind words and thank you all for reading.